For the debut race of the A1 Grand Prix series' second season at Zandvoort, A1 Team Germany will use Nico Hulkenberg as its driver. In the first of 13 rounds Willi Weber's team is banking on the 19-year-old youngster from Emmerich whose first contact with the A1 Grand Prix series was at Silverstone in August and who showed an impressive performance with very good lap times. The 4.320-kilometre circuit at Zandvoort is unknown territory for all teams in terms of the technical set-up because the race track through the dunes is being used by the A1 Grand Prix series for the first time. Heavy wind from the North Sea blowing sand from the dunes on the tarmac has a major influence on handling and thus the set-up. Many drivers, though – including Nico Hulkenberg - are familiar with the circuit from other racing series. 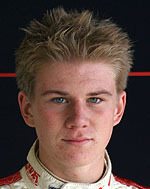 In the 2005 season he already won a race there on his way towards the title in another juniors' series. "I've got very fond memories of this demanding circuit and had been hoping for the chance to race there, "said the driver from the Rhineland. For him, it's virtually a home race: Emmerich on the river Rhine near Kleve borders on the Netherlands, and the circuit is merely an hour's drive for Hulkenberg, who also speaks Dutch. "Zandvoort is one of my favourite race tracks," Hulkenberg added. "I'm already looking forward to working with David Sears' team and representing A1 Team Germany's colours in the season opener. I'll go into the race very relaxed and haven't set my sights on achieving a concrete position."